Rain, rain, go away! Our tournament was postponed by rain and is rescheduled for Sunday, June 3. Our online art auction is READY TO GO. Bid on your favorites to snag a functional work of art for your back yard, and support a bunch of fantastic community organizations, too! 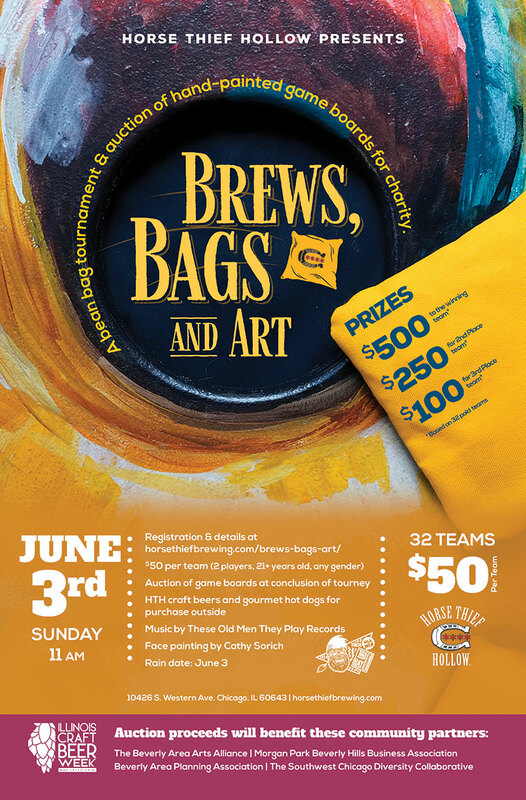 Join your pals at Horse Thief Hollow on Sunday, June 3, for our first annual “Brews, Bags & Art” event. 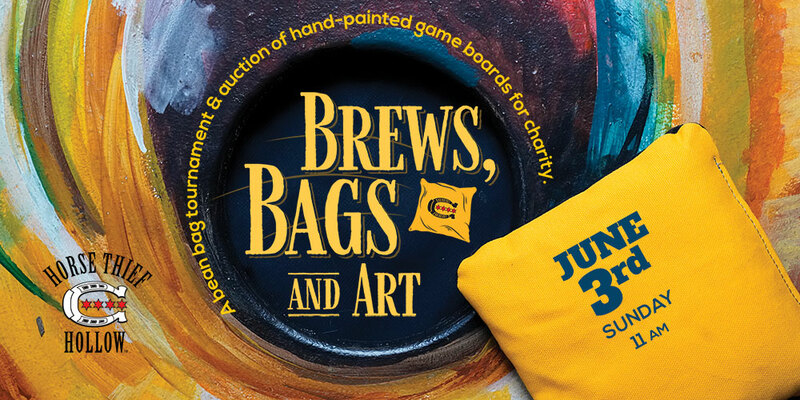 It’s a bean bags tournament and art auction rolled into one, a little somethin’ we put together in honor of Illinois Craft Beer Week, May 18–25. With food, music, and HTH craft beer—because we love a party! First things first: a pack of competitive teams will square off in our parking lot, playing with one-of-a-kind boards hand painted by local artists. Registration is limited to the first 32 teams that enter. Dragging your heels is not recommended. Register now via EventBrite. A team consists of 2 players, 21 years or older, with no gender rules. The entry fee is $50 per team. All teams are guaranteed 4 games (3 pool play + single elimination tournament). Registration and warmups are from 11:00 am to noon. Pool play begins at 12:00 pm and will determine seeding. Single elimination tournament play begins after the pool rounds. Competition will be held in the HTH parking lot, with up to 8 games playing simultaneously. Cash prizes will be awarded to the top 3 teams! 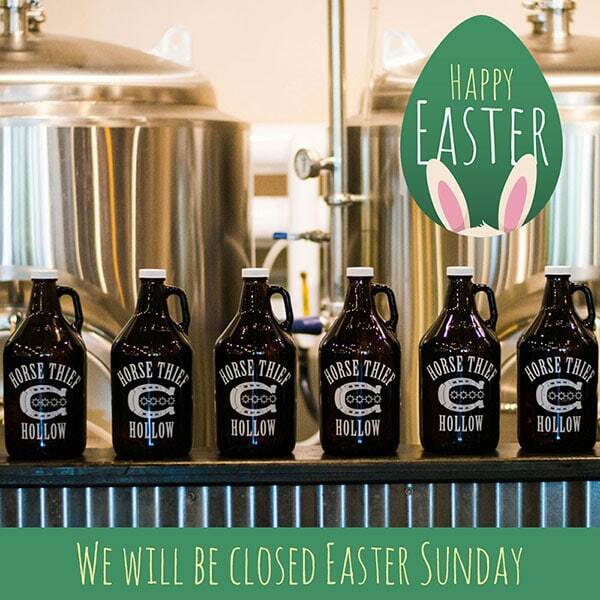 Starting at noon, we’ll have HTH craft brews and gourmet hot dogs available for purchase outside. Vinyl deejays These Old Men They Play Records will spin for us, and the talented Cathy Sorich of Marvelous Faces will be face painting. Be sure to check out our new and improved mural, which is being updated by HTH’s über gifted bar manager and artist Lizzy Benner. Every set of hand-painted tournament boards doubles as a work of art that you can proudly display in your home. Yes, they are for purchase! Bid on your favorite set now at our online auction page. The online auction is live now through the middle of June. So you have plenty of time to choose your favorite set and submit your bid. We’re NOT saying rain! But just in case of bad weather, our bags tournament and art auction has a rain date of Sunday, June 3. Filed under Chicago Craft Beer Week, Events, Fundraiser, Outdoor party.